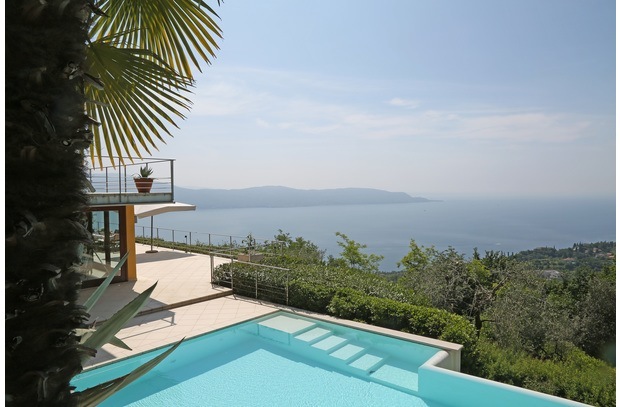 Situated just up the mountainside above Toscolano, Villa Nicoletta has absolutely breathtaking views over Lake Garda and offers complete privacy just 4km from the town. Set in the mountains, there are great mountain bike trails and rock climbing spots nearby as well as riding stables. Next to the villa is a restaurant and there is another excellent Osteria (restaurant/bar) in the village of Gaino about 1km away. The lakeside town of Toscolano is about 5 - 10 minutes drive away and has all the services, shops and restaurants you need. As well as the beaches, there is the ferry port where you can catch a ferry to plenty of towns around the lake. The car ferry leaves from here too and takes vehicles every half an hour to Torri del Benaco on the other side of Lake Garda. Please note The access road, though narrow, is paved and not too difficult. There is one steep spot of around 20m. 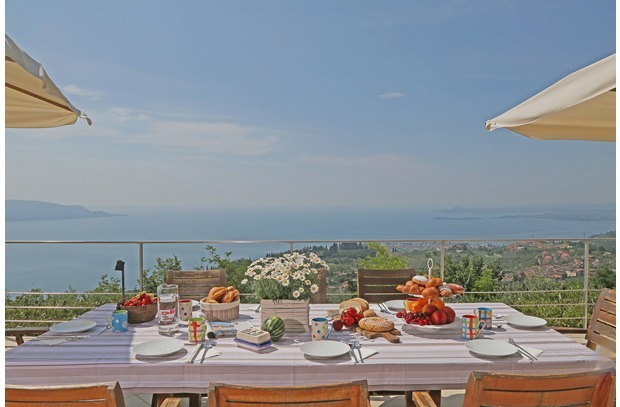 Recently renovated, Villa Nicoletta boats plenty of open, airy and bright spaces with floor to ceiling glass walls and doors - the very best way to let in all those spectacular views! 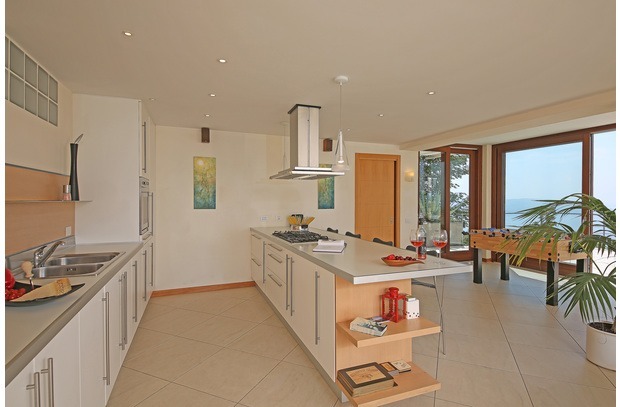 The ground floor boasts the open space living and dining area together with very well equipped modern kitchen, all of which opens on the wonderful patio area. 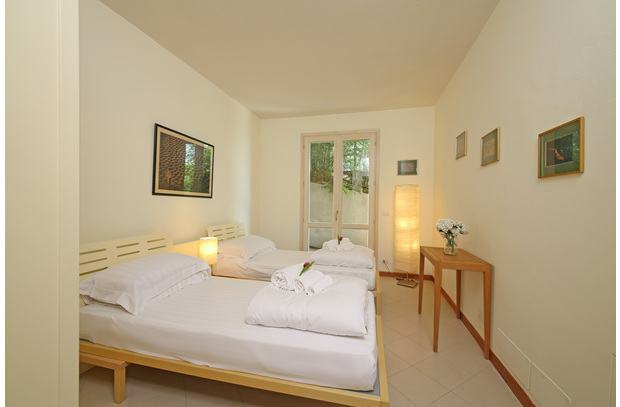 Sleeping up to 8 people, there are 3 double bedrooms and 1 twin room (this can be joined to make a 4th double room). 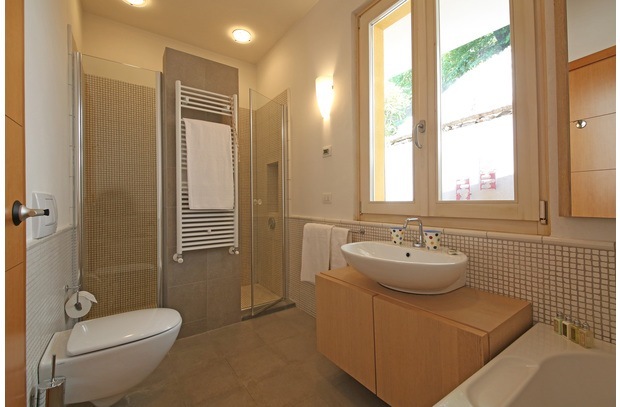 One double room has an ensuite bathroom with two showers. The other 2 double rooms also have ensuite bathrooms (toilet and sink only) and there is a family bathroom with shower and bath. 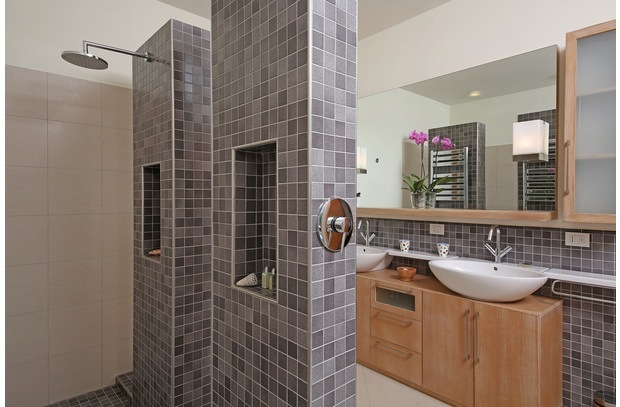 Downstairs is another bathroom with shower. Outside, the villa opens on to a beautiful patio area with barbecue and sun loungers - perfect for outdoor dining and relaxing. 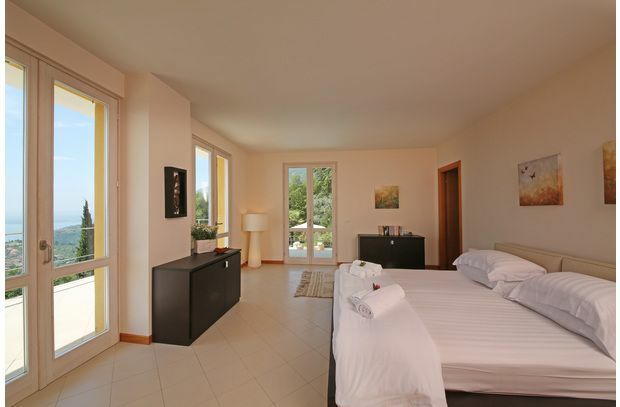 There is wonderfully large and private garden complete with olive trees and the villa has its own private infinity swimming pool. 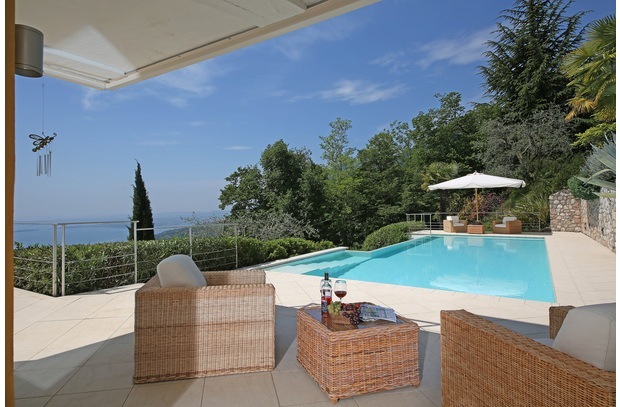 Complete with deckchairs and sunloungers, the pool has fantastic lake views from both the decking and in the water! Some other lovely features include a table tennis table, foosball table as well as a gravel pitch for boules. There is air conditioning in all bedrooms and there is WIFI and Netflix and Amazon video streaming. 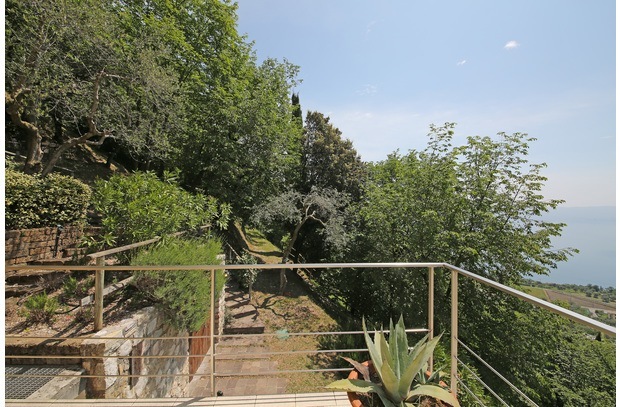 Please note The gardens are terraced and the modern railings have large gaps. Small children must be supervised at all times. A car is essential here. There is on site parking for up to 5 cars. 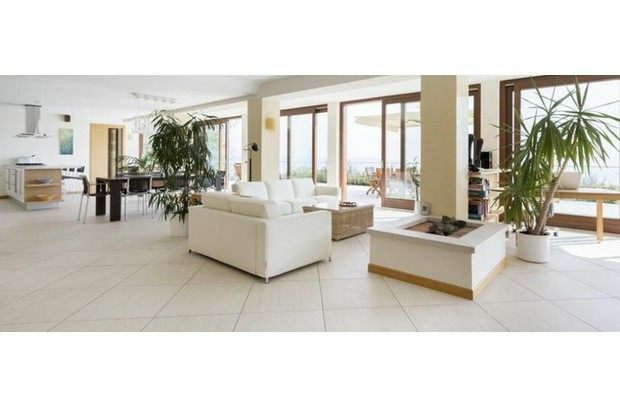 A wonderful villa, stunning views and a great, peaceful mountainside location!